BARRANQUILLA, Colombia, CMC – Sprinter Shashalee Forbes helped Jamaica make a clean sweep of the women’s sprints when she stormed to victory in the 200 metres at the Central American and Caribbean Games here on Wednesday night. After watching teammate Jonielle Smith capture the 100 metres on Monday night, Forbes comfortably raced to victory as Caribbean athletes swept the first three positions. Forbes clocked 22.80 seconds, ahead of Trinidad and Tobago’s (T&T) Semoy Hackett (22.95) and fellow Jamaican Jodean Williams, who finished a close third in 22.96. 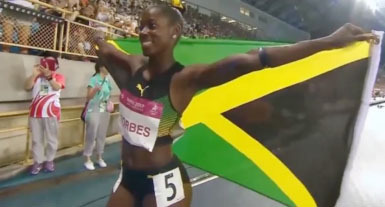 Forbes, who was running with a hamstring injury, said she was elated to win gold in the event. “I didn’t run like I wanted to, but I came out here with a lot of pain so to finish first is very exciting,” she said after the race. In the men’s 200 metres finals, T&T’s Kyle Greaux finished third in 20.26 seconds and Jamaica’s Rasheed Dwyer fourth (20.41) The race was won by Colombia’s Bernardo Baloyes in a time of 20.13 seconds, while Panamanian Alonso Edward finished second in 20.17. There was glory for T&T in the women’s shot put when Cleopatra Borel-Brown won the event with a distance of 18.14 metres. Cuba’s Yaniuvis Lupez finished second with a throw of 18.02 metres and MarÌa Orozco of Mexico grabbed third with 17.88 metres.